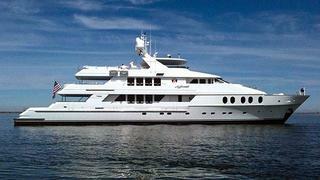 Mark Elliott at International Yacht Collection sends word of a $1 million price drop on the 44.4m motor yacht Aghassi. Built by Christensen in 2002, an elegant interior by Paola Smith sleeps 10 guests in a full beam master suite, two double staterooms and two twin cabins while twin new MTU 8V 4000 M60 engines give her a cruising range of 4,000 nautical miles. The master suite is full width and located forward on the main deck with his and hers en suite bathrooms and two walk in closets. Silk bulkhead panels in pastel shades soften the look of the interior decor and are combined with high gloss painted surfaces and natural woods to create a relaxed, gentle ambience. The four guest staterooms are below deck forward of the engine room and each has an en suite bathroom with marble surfaces. MCA compliant, Aghassi is now down to $13.95 million.